Which were the distribution and trade-routes, national and international, of 15th-c. Venetian printed books? Who purchased them? How were they used and read? What was the books' contemporary market value? Can we trace the transmission and dissemination of the texts they contain? Some fundamental questions relating to the introduction of printing in the West and the Renaissance booktrade still await an answer. The evidence is plentiful, over a million incunabula survive today; at last we also have adequate tools to convert the physical evidence they contain into new historical evidence On 1 April 2014 started the project "The 15th-century Book Trade: An Evidence-based Assessment and Visualization of the Distribution, Sale, and Reception of Books in the Renaissance ". The idea that underpins the project is to use the material evidence from thousands of surviving books, as well as unique documentary evidence — the unpublished ledger of a Venetian bookseller in the 1480s which records the sale of 25,000 printed books with their prices — to address four fundamental objectives relating to the introduction of printing in the West which have so far eluded scholarship, partly because of lack of evidence, partly because of the lack of effective tools to deal with existing evidence: 1. the distribution and trade-routes, national and international, of 15th-c. printed books, along with the identity of the buyers and users (private, institutional, religious, lay, female, male, and by profession) and their reading practices; 2. the books' contemporary market value; 3. the transmission and dissemination of the texts they contain, their survival and their loss (rebalancing potentially skewed scholarship); and 4. the circulation and re-use of the illustrations they contain. Finally, the project will experiment with the application of scientific visualization techniques to represent, geographically and chronologically, the movement of 15th-c. printed books and of the texts they contain. 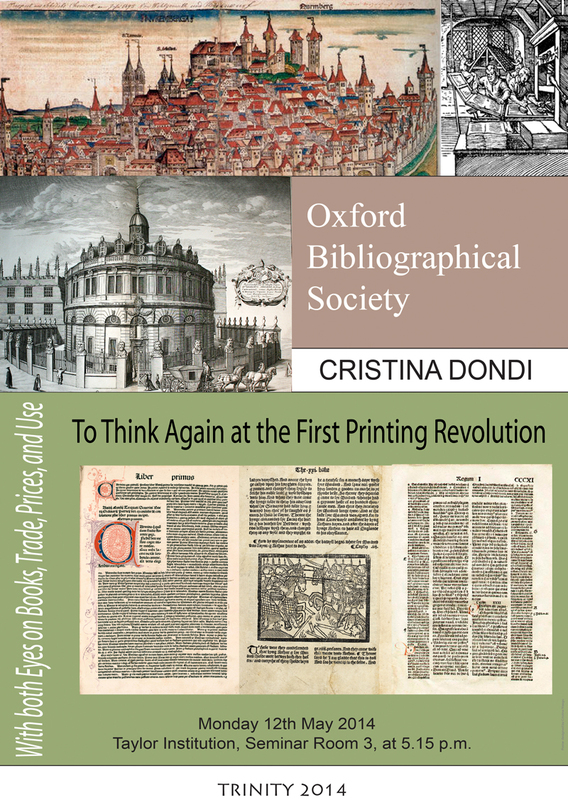 Cristina Dondi is Oakeshott Senior Research Fellow at Lincoln College, and a Research Fellow of the Faculty of Medieval and Modern Languages, where she is the Principal Investigator of the 5-year project 15cBOOKTRADE, funded by the European Research Council (ERC). From 2009 the Secretary of the Consortium of European Research Libraries (CERL), of which the Bodleian Library is a full member, Cristina was one of the editors of the Bodleian catalogue of incunabula, Bod-inc, and the creator of the international database Material Evidence in Incunabula (MEI) for the cataloguing and study of 15th-century printed books.